So I stumbled upon a 1200 year old feudal town in the middle of Hessen about 90 minutes drive north of Frankfurt up the A5 and half an hour away from Fulda. The only way to get there is down country lanes, and although there is a way there by public transport, it takes an awful lot of effort. I had to go there on a family errand and had about an hour to keep myself occupied while I waited. Schlitz actually used to be quite famous in the region, with its four castles built close together on a hill towering over the surounding low lands, previously known as Schlitzerland! The town is remarkably well preserved with many old wooden houses not jsut in the centre around the castles but also in the surrounding town lower down. Even the later structures have stuck pretty much to the old stle of the town so it is enjoyable wandering through the various lanes and alleys. I have to admit that when I heard that there are 4 castles on the hill, I had to do a double take. It isn’t immediately obvious what counts as a castle. 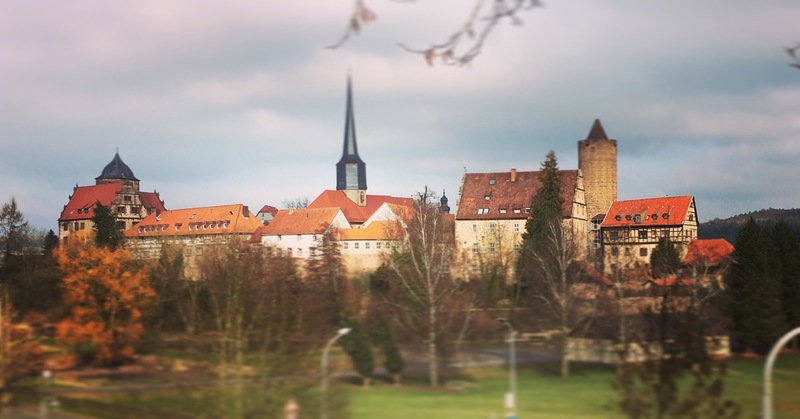 There is also a 5th castle (Schloss Hallenburg) down the hill just on the outskirts of the town which has been turned into the Hessen State Music Academy. It is more of a stately home or manor house than a castle, but this is partly a problem with translating the word ‘Schloß’. From my point of view there was only one genuine castle, Hinterburg, with the most prominent tower. There is lift inside which operates in the summer giving a good view of the surrounding areas. Right next door is now an old people’s home, but looks as if it is part of Hinterburg as they share a courtyard. Next, on the other corners of the hill are castles Vorderburg, Ottoburg and Schachtenburg which look more old town halls or large merchant houses and function now as a museums and old people’s homes. Essential information though, if you want free parking, follow signs to the Schloß Hallenburg and they have a largish free car park which is just a few minutes walk from the rest of the town. Secondly, there aren’t so many good places to eat in Schlitz, but two notable exceptions are a nice little Italian restaurant called La Gondola which does homemade pasta, and a German restaurant called Landgasthof Porta. And make sure to test the local beer. Of course every single old German town will tell you they are famous for their beer, but Schlitz still has the Auerhahn Bräu on the slopes of the hill which has just celebrated 430 years of production. If you are visiting, it is worth adding to the list!